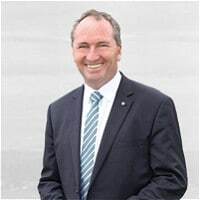 Australia’s Acting Prime Minister, Barnaby Joyce, has opened the nation’s first medicinal cannabis farm; situated near Tamworth in New South Wales. The project is being run by respected medical marijuana campaigners, Lucy and Lou Haslam. The farm has been named DanEden; after the Haslam’s son, Dan. With the assistance of his parents, Dan helped bring the issue of medical cannabis in Australia into the spotlight while he battled bowel cancer. Dan used cannabis during his illness to help relieve crippling pain. While Dan passed away last year, his mother (an ex-nurse) and ex-drug squad officer father continued their fight to legalize medical marijuana and vowed to establish a cannabis farm. Mr. Joyce has previously praised Mrs. Haslam’s tireless campaigning and has met with her on several occasions. Mr. Joyce had written letters of representation on the Haslam’s behalf to various arms of government. The issue of medical cannabis is one close to Mr. Joyce’s heart – his brother Tim has stage 4 bowel cancer. “When you can find a use for any part of a plant that can assist people when they are ill, when they are in pain, you should do it,” said Mr. Joyce at the opening ceremony at the farm today. As for the farm itself, little in the way of information is currently available. The $2 million project is situated on a 47-hectare property, but the exact location has understandably not been disclosed. “My goal is that in the short to mid-term we’ll be able to produce a product to supply people like Dan who need compassionate access to medical cannabis now,” said Mrs. Haslam in an interview with the Daily Mail last year. At that stage, the Haslams had not received any government funding for their venture and put their cafe on the market in order to support the venture. In comments to the ABC today, Ms. Haslam said the goal for the farm was to expand from cultivation to manufacturing. “We see it as a new Australian primary industry,” she said. As a result of her advocacy work, Lucy Haslam was nominated as a finalist in the 2016 NSW Australian of the Year Awards.